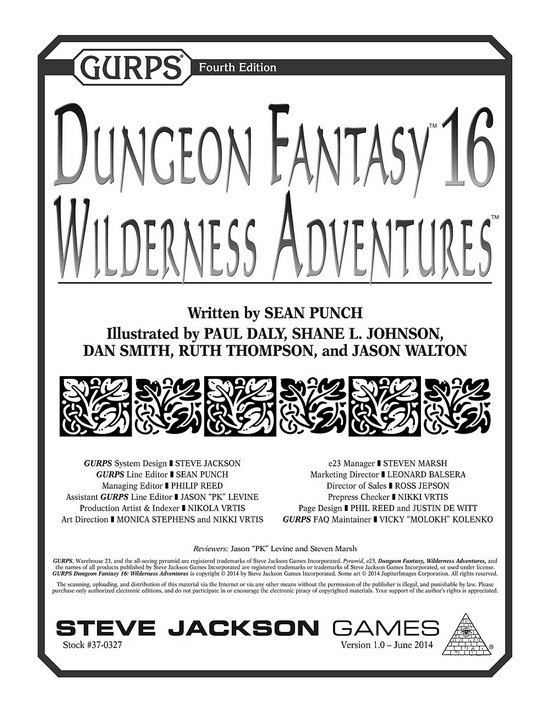 Work still nuts, but here’s a blatant shill: go buy DF16: Wilderness Adventures, by +Sean Punch. I have read perhaps two pages of this, and the biggest thing that strikes me right off the top is that it reads like Sean just had oodles and oodles of pure, unadulterated fun writing this. From the Introduction to the tongue in cheek (but still informative) lead-in text to the advice on how to use the templates/archetypes in wilderness-style games, it’s hugely engaging. More on this as I read it in depth, but my initial impression is that this book is simply well written, regardless of content. Or gorilla puns. No finer GURPS Day post can be had than a new release, and this one seems like a good one.